MANILA, Philippines - The National Police Commission (NAPOLCOM) on Monday, January 9, 2017 named the top 20 passers for October 16, 2016 PNP entrance and promotional examinations -Police Officer, Senior Police Officer, Police Inspector and Superintendent. Bryan Dacanay Sanchez obtained the highest place for Philippine National Police (PNP) Entrance exam, 86.16%. LendyRamirez Niaga topped the Police Officer exam with 81.80% average grade. Meanwhile, Jossef Erick Von Dancel Occena got the top spot for Senior Police Officer promotional examinations, 82.00%. Necy Rumbaoa Nanong and Robin Llanes Martin were the highest placers for Police Inspector and Superintendent exams, 77.51% and 81.87%, respectively. A total of 2,946 or 11.57% out of the 25,462 examinees passed the Philippine PNP Entrance Exam conducted in designated schools in Metro Manila and other testing centers nationwide. 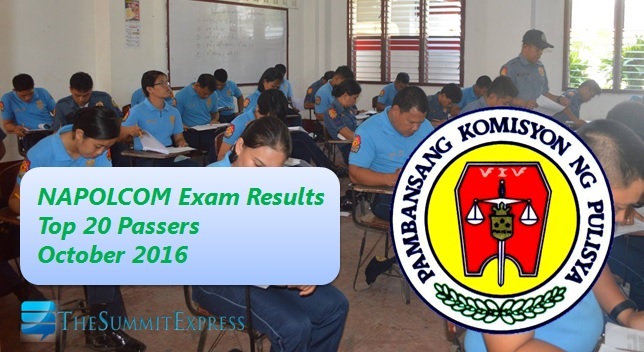 Out of the 6,567 who took the PO Exam, 1,220 (18.58%) passed while 1,267 (17.25%) out of the 7,345 examinees hurdled the SPO Exam.